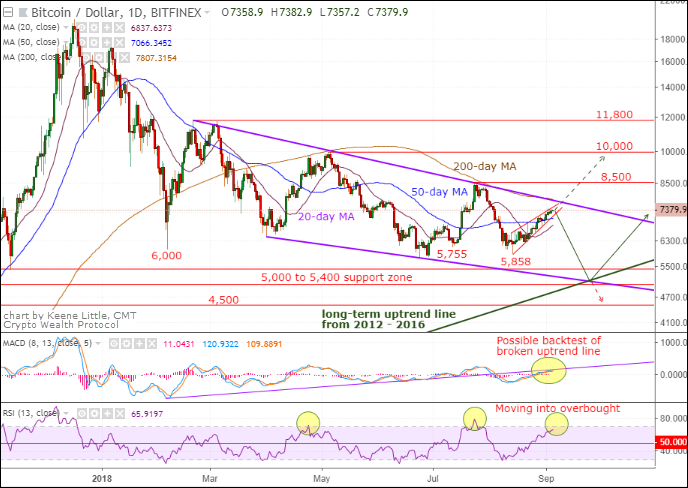 Bitcoin (BTC) has drifted higher over the past three weeks but the rise off the August 14th low has developed into a small bearish rising wedge pattern, outlined with the red lines on the chart. Price is near the top of the wedge, currently nearing $7,500, and the price rise is starting to show weakening momentum. The combination of weakening momentum inside a rising wedge pattern is usually a good indication that a pullback is likely. In addition to the top of the rising wedge nearing $7,500 there is also a 61.8% Fibonacci retracement level at $7,495, which only adds to the resistance at that level. The top of the larger bullish descending wedge (bold purple lines) is now near $7,800, also the location of the 200-day moving average. This combination is another important resistance level to watch carefully if reached. This means the bulls will have a lot of work to do in order to get through $7,400 to $7,800. It’s unlikely BTC will get through the $7,400 to $7,800 area on the first try, even if it does eventually break through in the coming month. BTC doesn’t get more bullish until it can hold above $7,800. In the meantime, the small rising wedge and the larger price pattern both suggest we could get one more new low before setting up the next bull run. A drop down to the $5,000 area remains a good possibility. While a drop to $5,000 would be annoying, especially since all the other coin prices would likely get pulled down as well, I believe it would be the last best opportunity to pick up BTC and other coins at low prices that we’ll never see again. Bitcoin is gaining credibility as an alternative currency in troubled countries. In recent newsletters I’ve talked about crypto exchanges serving Turkey seeing a spike in volume as its citizens abandon their sinking Turkish lira to buy into Bitcoin. Another country with a history of debt problems is Greece. Several years ago Greece was having a major problem with repayments of loans to European Union banks. There was no government bail-out; instead there was a bank bail-in. Depositors in Greek banks had to “contribute” a portion of their funds to bolster bank balance sheets and there were major restrictions on how much money could be pulled out of bank accounts on a daily basis. Several countries implemented the same kind of withdrawal restrictions. By the way, if U.S. citizens think they’re safe from similar restrictions, think again. Several years ago U.S. representatives passed a banking law that allows U.S. banks to tap their depositors’ savings accounts to bail themselves out of debt trouble. Considering the banks have not cleaned up their act from 2008, this is a real risk. Back to Greece, the number of Bitcoin ATMs is growing as demand for Bitcoin there. Perhaps they see another repeat of the recent past and their debt bomb growing bigger and more dangerous. Many countries are experiencing significant increases in inflation, which decreases the value of the local currency. Russia and China, because of their debt burdens and the need to raise interest rates to attract investors, are devaluing their currencies. But savers in financially troubled countries, and especially in emerging markets, now have an alternative in cryptocurrencies. 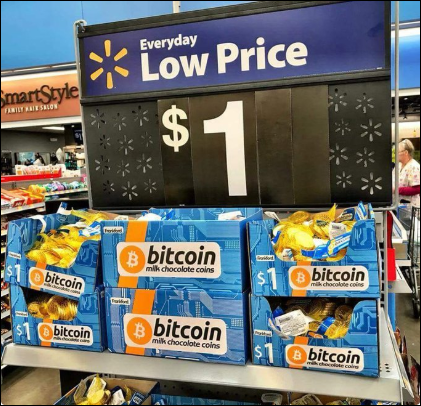 Another sign of the general populace learning about bitcoin comes from Walmart, which is now selling Bitcoin — kind of. OK, not Bitcoin the cryptocurrency but Bitcoin the chocolate (appropriately wrapped in gold foil). Perhaps it’s not a great leap from chocolate coins to the real thing. Familiarity breeds comfort. Hey Buddy!, I found this information for you: "Analysis: Recent Bitcoin Boost Still Not the “All In” Buy Sign We’re Looking For (chart)". Here is the website link: https://realdaily.com/analysis-recent-bitcoin-boost-still-not-the-all-in-buy-sign-were-looking-for/. Thank you.